An English electronic music duo formed in 1987 in Rochdale, Greater Manchester, UK by Rob Brown (3) and Sean Booth. Generally considered to be IDM in style, their music has incorporated a variety of genres and styles ranging from the generic (techno, hip-hop) to the experimental (ambient, experimental electro, musique concrète). Autechre's weapons of choice are analog synthesizers, though they also incorporate a variety of other synths, samplers and drum machines, including a favoured 606. They collaborate fairly regularly with other Warp Records artists and are heavily involved with the Gescom collective. Autechre are like a rich fruit that you are not sure you like, but you keep having to try another one because you can’t quite make up your mind. Pleasurable and strangely addictive. Probably got vitamins too. 19 hours of new live soundboards have been released on the Autechre webstore. Super-clever bastards with one eye on the dancefloor, one eye on your mind, and a third eye somewhere else entirely. Absolutely brilliant. Autechre and myself go back a long time, I first got to their sound at the age of 11 (1995) when I heard Eutow for the first time. It did play a major role in how I started to appreciate music and the styles of music I was looking into as a teenager. In late 2006 I got the album from a friend, rediscovered the track and got to know the artists behind it. Since then I have bene moving back- and forwards in their discography and having had the chance of seeing them play live a couple of times. Best moments ever. One of the most impressive skillsets AE has to offer is the art of adding X layers and elements in some of their tracks but creating a hollow, emptiness full of echo. Just mind-blowing. The duo's work started off fantastic, but since Exai the amount of album releases has become a bit stupid. Years ago, maybe 1991 or 1992, I presented a late night radio show on an RSL radio station (Restricted Service License) that ran during the Adur Festival in Sussex. I think it was called Adur FM and it broadcast from the glamorous confines of hospital radio studios in Shoreham-By-Sea. I presented it with a pal of mine and the music policy for the show was 'ambient techno' but it was pretty free-flowing and a lot of different stuff got played. It was quite a long show, at least 3 hours, maybe more. It went out in the middle of the night. The guy I presented with was more clued-up than me and he used to fix up some guests to come in. One night he said it was to be a duo called Autechre. They duly showed up with their equipment and played at least a half-hour live set, maybe longer. They also came up with some prizes to give away in a phone-in competition, but I don't remember what. I wish I could remember what they played.... and even more.... I wish I had a tape. My pal must have it though, as he always ran a tape and some of it (other shows, not the Autechre set) have turned up on Mixcloud. I lost touch with him and haven't seen or spoken to him for at least 10 years, probably longer, but I just left a msg on his Mixcloud feed, so maybe he'll get back to me one of these days. My favorite since 1993. Their early work takes me back to a transcending time. Later works engulf me in mathmatic sonics that are boundless. Changing and shifting timbre amongst patterns of multiple harmonics.... with machine-like brute; holding it all together as it emanates from the black digital darkness. 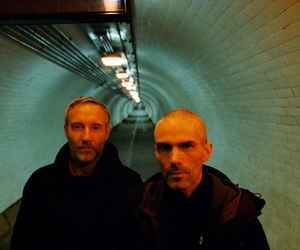 Autechre make some of the most detailed electronic music. It's fascinating to listen to the landscapes of shifting timbres they create. The NTS Sessions are incredible. As I grow into my mid life years knowing Autechre's sound for over 20+ years I can say it's been a great ride. They have taught machines how to make music for them. A glimpse of Artificial Intelligence in it's purest form. They are of of those artist that will be imitated but never duplicated.